It’s never too late for you to make your first $100 with Google AdSense in this year. As you all know, Google adsense is still the best way to monetize one’s blog. You might have been using Google adsense over the years and you have not reach your payment thresholds, then I think you should pay a very good attention to this post, and start using the them. Google Ad sense is a pay per click program that you get paid each time someone clicks on the ad on your site. The money you are been paid for individual click varies on the kind of keyword used, and how it relates to your keywords. For you to make money with Google adsense, then you need to learn some aspect of keyword research and the optimization of adsense. 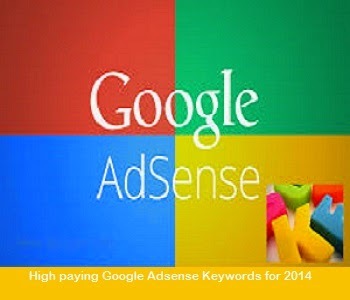 Today, I have taken the time to collate some list of Top high paying adsense keywords for 2014. These keywords are generated by using keyword research programs, and they will definitely enhance your adsense revenue. Below are the Top highs paying keyword for Google Adsense.